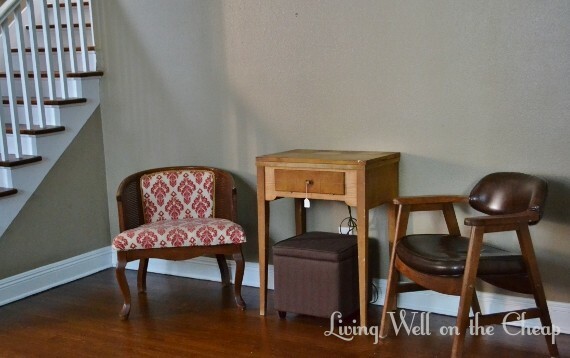 I’ve been keeping an eye on craigslist for the past few weeks looking for a small chest of drawers or table to put on the far wall in my dining room. I don’t really have the need for any additional storage in here, but I did think it would be nice to have a convenient place for setting up a drinks station when we host gatherings. I wanted something on the taller side and a little bit different from anything we already have. And I wanted it to be inexpensive. After work yesterday I took Jack with me to my favorite antiques shop (Aladdin’s Lamp for fellow Baton Rougeans). Miracle of all miracles, he kept his hands to himself in the stroller and didn’t destroy any of the numerous breakables within his reach. 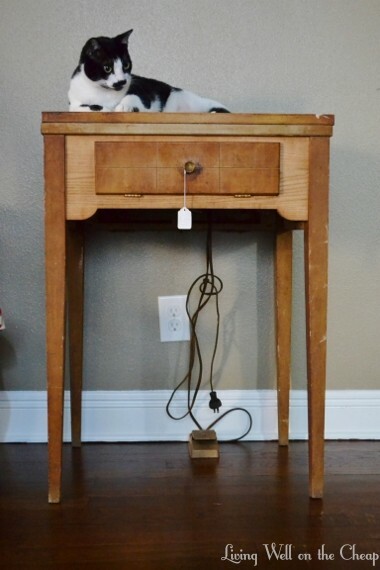 In the very very very back room I found this sewing table marked down to $40. The “as-is” condition is perfect for a home with pets and a small child. I can’t imagine anything they do to it making it look worse. The top folds over, revealing an ancient Singer sewing machine stowed underneath, and the little drawer hinges out. I assume it’s meant to stash smaller sewing accoutrements. I actually was not convinced right away that it would work so I asked the owner about their return policy. He made a note on my receipt that I could return it within two days if it didn’t work out, but after I left I realized that even if I miss the two-day window I could easily get my money back by selling it on craigslist. The scale is smaller than I’d imagined for this space, and the open legs leave the electrical outlet and cords exposed (though I realized after taking these photos that I could tuck the cords up underneath with the machine). I brought in another chair and a small ottoman to get a feel for how things might work if I found similar items. This ottoman in particular is not working, but one that’s a little larger and more colorful may do the trick. I’m thinking something like in the before photo in this post, though I’m jelly of her piano and would trade for that in a heartbeat ! The chair on the right is from the office. I don’t like it in here but the scale works and that’s exactly what I needed to know. I’ll live with it for a few weeks or months while I keep my eye out for an ottoman and armchair, and if I decided it’s just not working I’ll craigslist it without an ounce of guilt. I’m thinking this could work, though, especially once I get some stuff up on the walls. I’d like to hang a mirror and tons of family photos in an eclectic mix of frames. Thoughts? 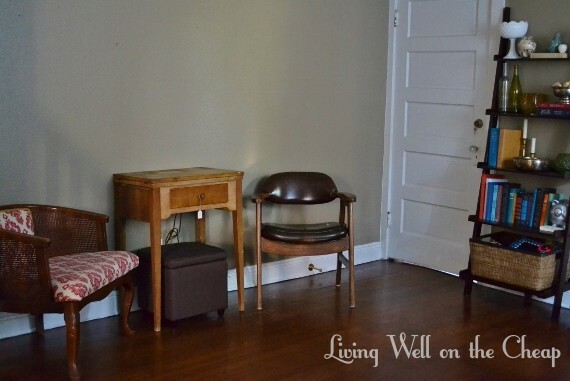 Yep, I am currently on the hunt for another chair to flank it and a different ottoman/basket to slip underneath. 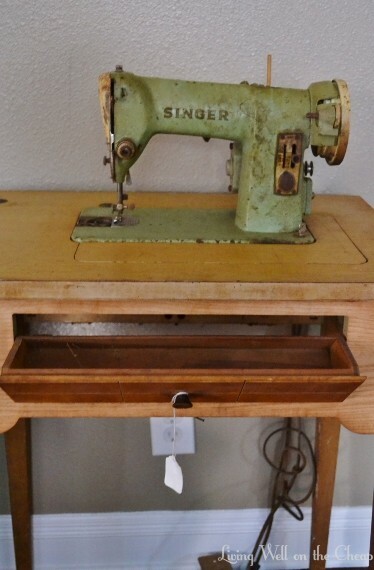 I do love the idea of having the sewing machine on display in a guest room though!